Whitsunday Touch Association plays on Monday nights at the Whitsunday Sportspark, Shute Harbour Road, Jubilee Pocket,Airlie Beach Qld 4802. Seniors play around 40 weeks of the year and we also run a Junior competition prior to our senior games. The senior competition is currently in a mixed format only and is split into A, B and C grades. The Summer competiton generally runs from early February (the first week of the school term) through to the last week of school in June. The Winter competiton kicks off in July in the first week of the new school term and finishes in the last week of school in December. Games are usually 20 minutes each half with games scheduled at 6:15pm, 7pm and 7:45pm. 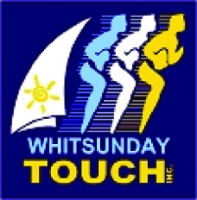 The draw, results and informtation can be found in the weekly article on Touch in the Whitsunday Times newspaper or on our Facebook page https://www.facebook.com/WhitsundayTouch. Our Junior competiton strats at 5pm on Monday afternoons and there is an article with more info in the News tab on this page or our Facebook page. You can register your child at the tab along the top of this page.